In addition, Finley maps the Buenaventura River running from the Rocky Mountains westward through 'Salt Lake' and westward to San Francisco Bay. The Buenaventura is the last incarnation of the apocryphal River of the West, a long sought after speculative alternative to the Northwest Passage. The mapping of Buenaventura here again references legitimate discoveries by Escalante of the White River and the Sevier River. In this case, both are mistakenly associated with the River of the West and given an erroneous outlet into San Francisco Bay. There are additional notations on several Arctic expeditions in northern Canada by Kensir (1789), Hearne (1771) and Franklin (1821). Each identified a sea between the 60th and 70th parallel. Though not fuller explored until later, these are most likely the first sightings of Dolphin and Union Strait, Austin Bay, Coronation Gulf and the Dease Strait. These bodies of water lie between the North American mainland and Victoria Island. Mile scale and title in the upper right quadrant. Engraved by Young and Delleker for the 1827 edition of Anthony Finley's General Atlas. Good condition. Some minor discolorations in outer margin. 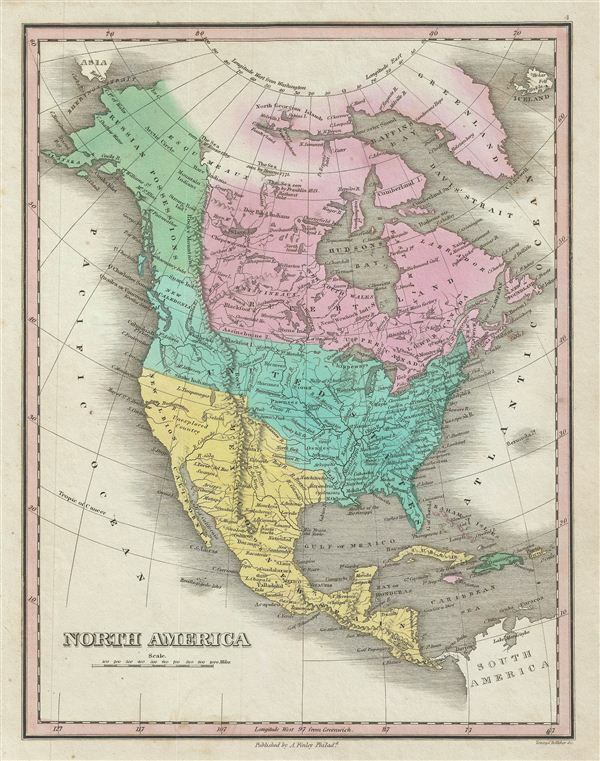 Some manuscript annotations regarding the U.S. - Canada boundary in the upper left quadrant. Original pressmark. Blank on verso. Rumsey 0285.004 (1831 edition). Phillips (Atlases) 4314, 760, 752, 6045.